Due to ever-changing economic environments and growing technological innovation, the financial sector has presented more possibilities for industry professionals. Around the world, employers are looking for skilled, driven, and knowledgeable financial experts who will bring added value to their team and portfolio of work. A master’s degree in finance may provide just the foundation needed to meet employer demands and secure a place as a leader in the industry. 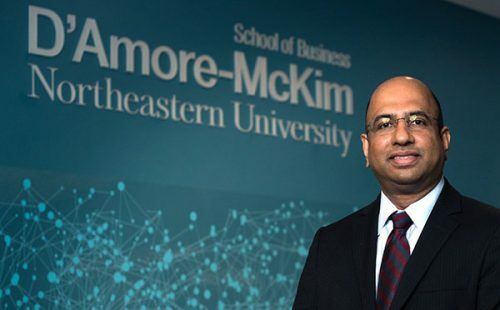 By choosing Northeastern University‘s Online Master of Science in Finance (MSF) program, you will attend a prestigious business school that can advance your expertise, prepare you for leadership roles, and give you real-world practice – all without needing to attend the classroom environment. The curriculum emphasizes on experiential knowledge. During the 30-credit-hour program, students cover a breadth of finance topics in six core courses and four electives. In the Mergers and Acquisitions course, students explore the climate that gave rise to a large number of corporate mergers and the business factors that lead to these large-scale corporate consolidations. By examining everything from accounting to legal factors undergirding mergers and acquisitions, students can learn how to appraise a potential merger and how to structure one for beneficial outcomes. Meanwhile, in the Business Turnarounds course, students can learn how to diagnose, prescribe, and implement actions relating to various business turnaround activities, including bankruptcies, liquidations, and workouts. Instructors highlight key case studies and readings to guide students through the complex environment of ethical, legal, and general business issues associated with corporate turnarounds. Students who complete this track can improve their competitiveness for several careers. Economic trends in particular can present opportunities for professionals who gain new skills while specializing in corporate finance. For instance, a 2018 Deloitte survey of 1,000 executives revealed 70 percent of U.S. respondents believe merger and acquisition deal flow will rise in the following year. Companies will need skilled finance professionals to guide these transactions, as well as address other factors that present risks and opportunities. In the Fixed Income Securities and Risk class, students learn about theory, applications, and evidence regarding sensitive interest rate products. Instructors facilitate discussions about new developments in areas ranging from asset/liability management to concurrent interest rate and exchange rate management. Additional topics covered may include anything from confronting domestic and international financial and corporate management to how to customize a risk management program. The Portfolio Management course details portfolio construction, revision, and measurement. Instructors may cover subjects ranging from the effects of diversification on risk reduction to transaction costs on fixed-income and equity security portfolios. Students that pursue the Investment Finance track can seek roles related to investments for individuals and entities. Wealth management in particular could continue to see increasing demand as more Baby Boomers approach or reach retirement age, especially in the U.S. and U.K., according to Fidelity Worldwide Investment. These consumers need advisors to help them allocate their retirement and other assets, and organizations that manage funds related to these transactions need analysts who can maximize returns while limiting risk. Corporate Finance vs. Investment Finance: Which track should you choose? The decision of choosing to pursue one of these two specialized track depends on both the career goals and interest of each individual. Both tracks were designed by industry experts to provide an ever-evolving and relevant path to success in the field. Additionally, the MSF program overall can help professionals build their network further to find the right job for either area of expertise. By connecting with instructors and peers in an online environment, students can extend their networking capabilities beyond their offices and surrounding communities. These connections can help these finance professionals explore opportunities that align with their career goals. You can learn more about Northeastern University’s Online MSF program and admission requirements here..